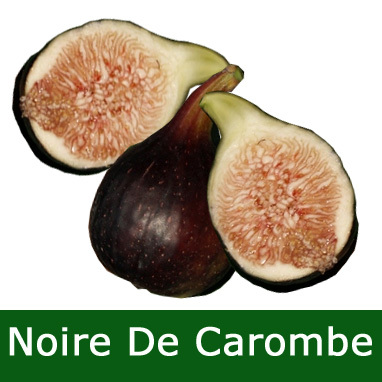 Noire De Carombe fig tree/shrub provides quite large fragrant fruits with a fine deep Violet or Black skin. Noire De Carombe is frost resistant providing the roots do not become frozen and is resistant to many diseases. Being self-fertile, it will produce fruit without the need of another fig tree in the vicinity to pollinate and can grow to 6 metres (18 ft) height 50 - 100cm in a 5L pot, 2-3 years old. Depending on weather and local conditions you may get fruit within the first growing season. Supplied as a tree or a shrub however the shrub form can be pruned and staked into a tree form if you are after an ornamental look. Most fig trees thrive better in a sheltered but full sun position i.e. facing South or South West. For larger crops of figs, contain the roots because if allowed to grow uncontrolled, the tree will do a "Prescott" (Put all efforts into getting bigger). Fig tree roots are known to be wanderers and can travel quite a distance. Keep in a 45cm (18 inch pot) or more, which can also be buried for a conventional look. Do not fill with soil, leave at least 10 cm (4 inches) for compost which will be required every year or other form of feeding. You can vary the size of the pot or other root restriction e.g a hole surrounded with buried paving slabs and broken brick on the bottom, the rule of thumb is the smaller the pot or confined area, the smaller the tree will be but pruning can also be used to restrict final size. We put ours in 80 litres containers and may take them up to 150-200 depending on their progress. No need to worry so much about soil quality, Fig trees will thrive in most conditions, especially chalky. For legal reasons we should point out that a nuclear winter, meteorite strike and agent orange do not come under "most conditions". White Marsaille, Bayernfeige Violetta, Ice Crystal and Brown Turkey are best for outdoor growing, most others would benefit from some form of shelter. If don't have enough friends to give them away to then try preserving figs in the drying cupboard. Rotate them daily and in 6-8 weeks you will have dried figs and possibly a lot of wet washing. This is our most popular Fig Tree, possibly because of the distinctive sweet taste. As with all other restricted root growth or containerised trees, ensure you water regularly, especially in summer when 3 times a week in very warm weather maybe required. If potted, the smaller the pot, the quicker it will dry out. Although fig trees can cope with drought, it will cause the figs to drop prematurely and too much water will cause the fruits to split. As a guide, if the top 4-6 inches of soil are dry then time to water. Little and often in the mornings or evenings is easier and better than a lot in one go however we all have a life so don't loose any sleep over it. A mulch will reduce evaporation and therefore the need to water as much. We are experimenting by growing Red Clover at the base of our containerised trees. They are a green manure and should reduce the need for watering. If the Fig tree is struggling e.g. leaves not so healthy, fruit production poor, our of breath when it climbs the stairs then feed with compost/well rotted manure or high potash liquid such as tomato feed once the fruit starts to show.Potted fig trees and restricted root growth will need feeding more than planted trees. Advice on feeding varies from not at all if the soil quality is good to every week once fruit starts to show. If the tree looks healthy, we tend to let it get on with it. Some Figs are hardy down to -10 centigrade but the tips are vulnerable to frost and this is where the fruits will be made. If you live in a particularly harsh frost area or your potted Fig tree is the equivalent to Wilson the ball from Castaway and you take it on Polar expeditions with you then you might want to wrap it in fleece if planted during the frost season or move to a warmer environment if potted e.g. greenhouse or conservatory, even a shed or garage. Be wary of the white sap when pruning as it can be a skin irritant. If your fig tree is looking a little sorry for itself, hard prune and leave, it will produce new growth and recover. Try not to take more than 25% off if possible. The best time to prune a fig tree is in Spring although removing dead or diseased branches can be done at any time. Cut out any branches that are crossing with others. In early summer, shorten the new growth to 5-6 leaves to encourage new tips formation which increases fruit yield. You can train your tree as a fan shape or as a standard "lollipop" shape. When pruning your fig tree, aim for an open crown. This is when you allow the light and air into the centre of the fig tree. If you are going to remove a branch, ensure you leave a 2 inch or 5 cm stub. When the fruits start to appear, cover with a net to deter birds. The fruits are ready when they start to droop on the stalk with well coloured skin or the skin cracks. In very warm climates and some greenhouses depending on location, you get up to three flushes of fruits. Only the small embryonic fruits forming on last years growth will turn in to ripe fruits. A second embryonic crop may appear in the summer and if they survive the winter should ripen the next year. In November, any figs larger than little embryos (about pea sized) should be picked off as they are unlikely to ripen or survive the winter. So in summary, leave the small pea sized fruits alone all year but in Autumn pick off all those larger than that. Unripe Figs will not mature after they have been picked unlike some other fruits. If you do not know what type of fig tree you have, give it a sunny and sheltered spot. If you have one of the hardy varieties e.g. White Marsailles, Brown Turkey, Ice Crystal and Bayernfeige then a sunny spot will do. If containerised, bring it into a greenhouse, conservatory or other protected environment (armoured vehicle?) during Winter. Planting close to a south facing wall will help but fan training it against a south facing wall will be even better. Most fig trees can spread up to 3m if left to grow unchecked. All cuttings will grow into female trees and bear fruit. Figs are apparently good for treating warts! Figs can be used as a laxative and are good for diabetics as they are high in sugar. It is thought figs originated from Asia. A maintained fig tree can crop for centuries if looked after.